Same principal applies in this as to a thick piece of steak or even a roast, smack it with some heat and finish it in the oven. You can also do the same flavour combination with pork chops; pork, sage and lemon work very well together. If you wanted to in this recipe you could easily deglaze the pan with some wine or stock while the meat is resting to make a sauce and bung in some cream or butter or just reduce it. I opted tonight to finish this dish with a balsamic reduction I bought from a deli. Preheat an oven to 180C. Season the pork loin with lemon rind, salt and pepper and coat lightly with oil. 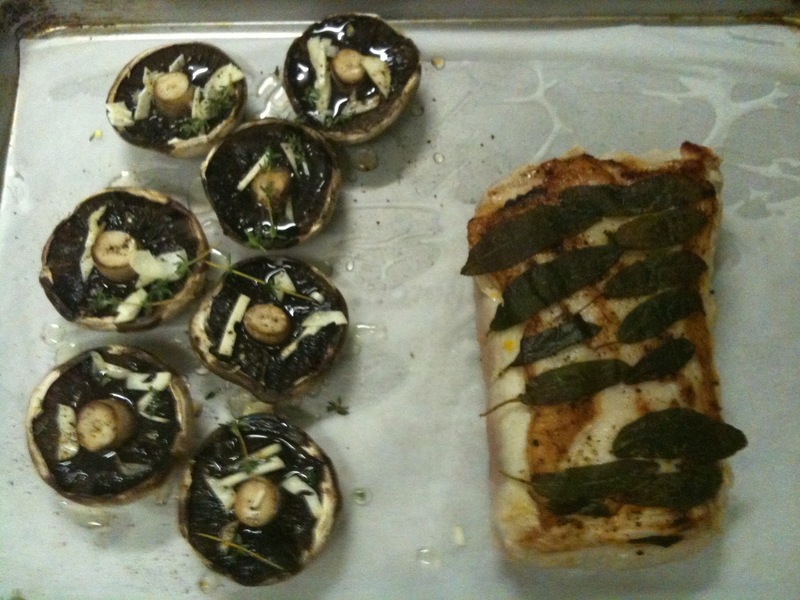 Add the sage leaves to one side of the loin, pressing them into the oil to make them stick. Heat some oil in a large frying pan to medium high. When hot add the pork loin, sage side down and sear until it has good colour, Carefully turn and repeat. When seared place on a lined baking tray (easier cleaning) and into the oven to roast for an hour. If your piece of pork is heavier or lighter, adjust the cooking time. Cook for 20mins per 450gms plus 20mins. Remove the pork to a clean plate, cover and allow to rest. I also cooked my mushrooms at the same time. I found that I needed to add a little more oil to the mushrooms toward the end to stop them from drying out. When ready to serve, carve the pork to your desired thickness then spoon over a little of the resting juice. Arrange the pork on plates and drizzle over some balsamic glaze (or even a squeeze of lemon). Serve with baked mushrooms, pan roasted potato and steamed broccoli.